A Little Friday Tech Humor : Are Social Networks Too Powerful? Ok, leave it to Japan to name a cybernetics & robotics company after a fictional one that led to the rise of the Terminators. In Tsukuba, Japan, Cyberdyne, Inc. has created HAL (yes, HAL) a mobility suit that reads brain impulses and helps assist those with mobility problems move around. It works, in principle, similar to Ironman's suit. Amplifying the electrical signals sent by our brain to our body, to activate the suit as well. 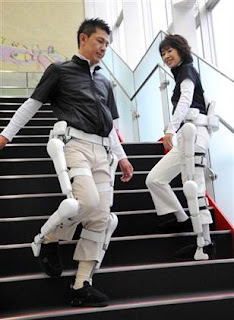 This suit has already allowed a 49-year old man who is paralyzed visit France. That in itself is a worth cause right there... hehehehe.